Discussion in 'Muppet Appearances' started by Phillip, Nov 25, 2009. On Thanksgiving morning, don't miss Kermit and Tiffany Thornton singing "I Believe" at the Macy's Thanksgiving Day Parade. The studio track will also debut on Radio Disney this Friday. 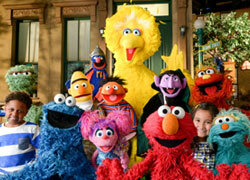 The Sesame Street cast and their annual balloons (Big Bird, Super Grover, Abby Cadabby) are also scheduled to appear. The Macy's parade airs on NBC. Check local listings for times in your area. After you watch the appearance, post here and share your thoughts. just seen the Kermit balloon... GOTTA love it! Kermit looked fantastic. Cn't wait to hear him sing later on in the parade. The Sesame Stree float was just as wonderful too. 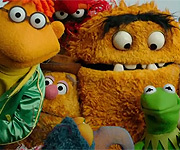 Great music and lot's of great Muppets. It's obvious that Jim's legacy will live on for eternity. Im excited! its starting how, anyone notice how the opining act with the cheerleaders, their costumes all look like Homestar Runner? I hope I didn't miss it. I was doing some running around. They really haven't mentioned lately. I think he showed up before they showed Santa last year. I hope that's the case here and obviously I hope it's Steve performing him. The float just appeared on CBS (almost missed it because I was channel hopping - pun partially intended ), which means that we'll probably see it on NBC shortly - that's been the trend with the broadcast thus far. I don't know. It's almost over and they haven't even mentioned Kermit. I'm hoping if I did miss it, someone will put it on You Tube. He's coming on after the commercial break. EEE! I don't like the hip-hop tone they gave it. Last year' was much better. I'll take a Muppet appearance when I can get one, but this version of "I Believe" was just too pop-py for my tastes. I liked last year's version better. It just seemed more magical. Always cool to see the Kerm-meister, but I agree with Oscarfan, I think last year's was a little better, but still cool to see Kermit irregardless. Just a little sad I missed the SST float and Abby balloon, but oh well.